As the Jubilee Weekend approaches the weather has become very British, wet and cool. Nonetheless our teams have continued in anticipation of a good earning period. The dmu group have formed up a splendid three car unit which includes E51505 that has received quite a makeover with reupholstered seats, a fine first class area, varnish to the exterior, a startlingly bright yellow end and treatment of the previously flaking roof over the cab. Many congratulations to all involved and to Leigh who has put a good display of before and after photos within the vehicle. 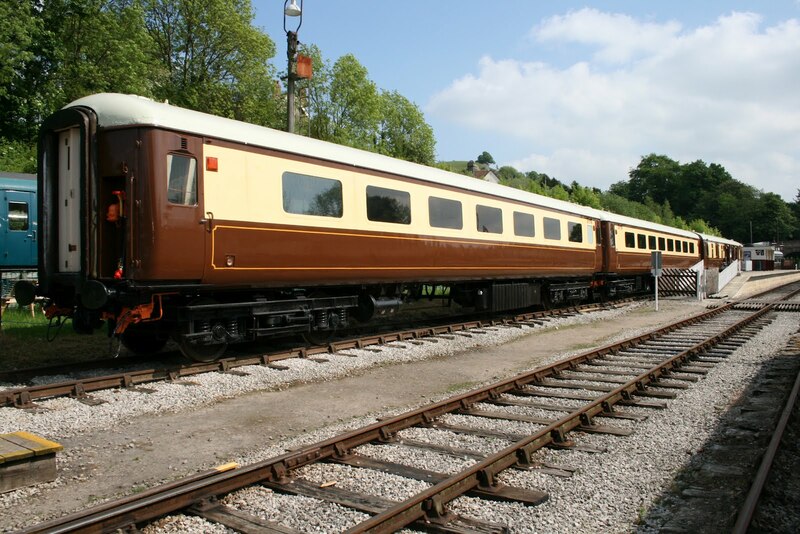 The dmu group have also fed, cleansed and watered the units for the holiday and continued to work on the "Bubble Car" as its restoration draws to a conclusion. Iris was used for a charter to Duffield for a coach company based at Storrington in Sussex. The participants were quite elderly and somewhat infirm but were gathered in and received in our inimitable way. The PWT concentrated on creating a work zone that would allow activity during the summer at Shottle as regular Tuesday services start operation and the number of charter trains continues to grow. Some 160 metres of safety fencing have been erected at Shottle and the team have boxed up a further 80 yards of the loop. The VCT also coped with the charter operation and had a three fire day between Ken Rowlands Crossing and the Sewage Works bridge burning the remainder of Tuesday's brash and more created today. Today's charter also produced an opportunity to sell some extra seats to the visiting public which provided much needed extra income. No3 had remedial work to an injector which was placing the plans for the upcoming weekend in jeopardy - my thanks go to the team of three from the DST who resolved the problem. The Booking Hall, in addition to today's opportunities, processed a further three charter enquiries and the Buffet Car enjoyed a mini boom from the waiting charter customers and a steady trade from the passing trade. Many thanks to all involved as we are as ready as we can be for the Bank Holiday. A photo is attached of our ever growing fleet of gleaming vehicles. We know from all our visitor comments that presentation is all and we have yet again moved up a gear! It's an area we don't need to be modest about. Quite a pleasant warm day as Network Rail put a supplier through his paces with a new form of trolley surveying device. The team then retired to the Pullman Buffet Car for a significant amount of food that helped our cause. They were looked after by Bob Swepstone on our behalf and declared it a successful day. The PWT spent the day at Shottle and jacked and packed a further 80 yards of the loop project and tended to some difficult fishplate bolts. The LCC cleansed the Training Room carpet and gave Iris a thorough clean and the Head of Gardening glowed a little after tending the bank at Wirksworth. We were grateful to our neighbour, Charlie, who strimmed the bank opposite the Booking Hall. The Filing Fairy put in a second day of document checking as we head towards being squeaky clean in this area. The Pullman Buffet Car and Booking Hall continued their revenue generation for our enterprise. Another epic day with a record of achievement. Whilst writing this commentary I think of Mike and Pat Craft who will be sipping tea and enjoying cucumber sandwiches in the garden of Buckingham Palace representing the Railway and ensuring Her Majesty is in possession of an EVR timetable leaflet and share prospectus. I hope they have enjoyed their day and thank East Midlands Trains who ensured they travelled Up to Town in style. Perhaps they will sample the Champagne Bar before returning to real life. Back at base the VCT set off for Ken Rowlands crossing before the first charter train journey. Through the day they tackled the area between the crossing and the Sewage Farm overbridge reporting a two fire day. Alan continued his renovation of the railings on DJW19 at Barnsley Lane and applied gloss to milepost 139 1/4. A blast from the past was observed tending to another set of railings south of Barnsley Lane in the shape of he who was formerly known as "Virgin Dave" and now known as "Cross Country Dave" and very good it was to see him back in the fold. The PWT had to work around today's charters but managed a splendid 12 pairs of fishplates greased on the Incline, a member of the team wished me to emphasize that this was 24 fishplates! They then went on to replace bullhead keys in the Cemetery Lane area. Essential maintenance jobs done in somewhat difficult circumstances. A charter was provided for the International Combustion Retired Employees Association with coverage of the whole line and some very happy customers delighted by both the journey and the meal provided in the Pullmans. The DST concentrated on a variety of jobs to aid the finalisation of Henry Ellison's restoration. Attractive planters were provided by Dorothy to sit outside the Pullman Buffet Car and she had completed the hanging baskets for Duffield Main Line yesterday which all aid to put us in the premier league for presentation. David spent a lot of time today to further refine the top security gate at Wirksworth to good effect reflecting very necessary but largely unnoticed work to keep us as safe as possible from unwelcome visitors. Having relaxed yesterday to celebrate a few birthdays in the Railway Inn, Shottle I returned today to find that John had completed the third lining out of our Pullman set and a photo is attached. Rupert's premature comments about names reflect a certain impatience but I am open to receive the first £10,000 donation to put any name required on one of the vehicles. The LMSCA reported, quietly, the deafening effects of needlegunning on the BTO and much progress in reassembling the north end cladding. A further report from yesterday's pw activities was the cutting and replacement of two fishplate bolts at Hazelwood. Lastly, and with great pleasure, a call was received this evening from John Rhead to announce his engagement after a successful proposal at Port Merion. Many congratulations for a long and happy married life. I suspect uncovered guards turns are not quite top of his priorities at the moment. Another hot day with 80 tonnes of ballast delivered to Shottle loop by steam traction. Much shunting required to get the vehicles in the right order and no less than 3 vacuum bags replaced to enable automatic brakes on the hoppers. Success in the end with No 3 performing faultlessly as usual. Also it gave much needed training for the firemen both maintaining steam and loco control. More weed killer applied in the ideal weather conditions with particular attention paid to bridges and platforms along the line from Wirksworth to Duffield. A delightful and indeed rather hot day here in the Gem of the Peak. soon be a most pleasant and well-turned out addition to the fleet. east side of the Model Railway Container. part of its crew training, and carried several surprised passengers. A sweltering day at Wirksworth, with many happy passengers riding through the beautiful valley and sampling the local ice cream. Down the yard, the DMU team painted parts of the underframe on 51505 ready for traffic next week, The 8F group sweated over Henry Ellison's boiler and the PDLG worked on the 33. What an unexpectly busy day its turned out to be. We had scheduled a Steam Taster day and a charter to Duffield and return within which we had to weave in a test day as yesterday's customer had some difficulties with their equipment on arrival with us. As Mick was today's No3 driver, Charles Marsden stepped into the breach to host our test customer and I am very grateful for his contribution. The test vehicle and accompanying Landrover had to leave early for Duffield to be back in time to free the line for the charter and then complete its work on the Incline in between the morning and afternoon Steam Taster clients. All turned out well thanks to everyone's cooperation and the charter customers were treated to a great deal of extra activity. They took tea and biscuits before their journey and returned for a hot lunch afterwards making reasonable contributions to fares, the Pullman Buffet Car and the Booking Hall shop. Mick and JHT had a torrid time on No3 as temperatures soared and will certainly sleep well this evening. 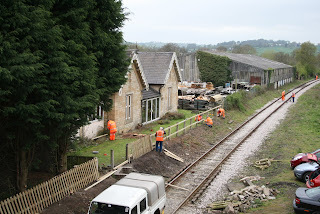 There was further varnishing at Duffield and electrical work at Wirksworth. Alan Taylor continued his renovation of the railings on DJW19, just north of Barnsley Lane, and prepared and undercoated milepost 139 3/4. Anton found a window to apply a little paint to Model Railway container. The VCT Landrover has been serviced including a new starter motor and the doors now close in the fashion of a Rolls Royce, a soundless click, we do spoil them. A face some of you will remember, Charles Roberts, has decided to holiday at the Malt Shovel for a few days - wise man. Another day of great endeavour with an initial wait for today's significant customer who had left Glasgow at 0500 this morning and found, on arrival, that they were short of some vital parts. After resolving this with local suppliers and sampling the Pullman bacon butties a decision was taken to recommence at 0730 tomorrow. It's a ill wind! Meanwhile, an extremely expensive piece of equipment from Amazon was trialled by Richard Preedy to aid the weed control programme. This wonderful backpack, holding 20 litres of treatment, required some discipline to prevent Richard tumbling backwards under the weight. He is now enrolled in a body building course. The dmu team used the pressure washer to cleanse the below sole bar areas of the two car set and then applied black paint on the footboards producing a significant improvement to the vehicles presentation. It turned out that our new recruit, Tim from Aberdeen, used to paint fishing boats and felt quite at home with his new role. The other part of the dmu team worked to release 51505 back into service and further progress the renovation of the "Bubble Car". The PWT commenced the lengthy process of fishplate greasing in the Wirksworth station area and Tony tackled some gaps on the Incline where the head of the rail had burred over. John Allsop returned to continue lining out the Pullman fleet to great effect and the VCT returned to Barnsley Lane to make inroads to our neighbours tree felling activities. Alan concentrated on the railings at DJW19, the river bridge adjacent to Barnsley Lane being a little frustrated when he ran out of paint. The Booking Hall triumphed with a group booking enquiry from the Branch Line Society which will require an input from all our departments for a large reward. The Buffet Car welcomed a number of guests throughout the day. We can't complain about the much wished for heat but great credit goes to everyone who moved the project forward and grew pinker or browner through the day. 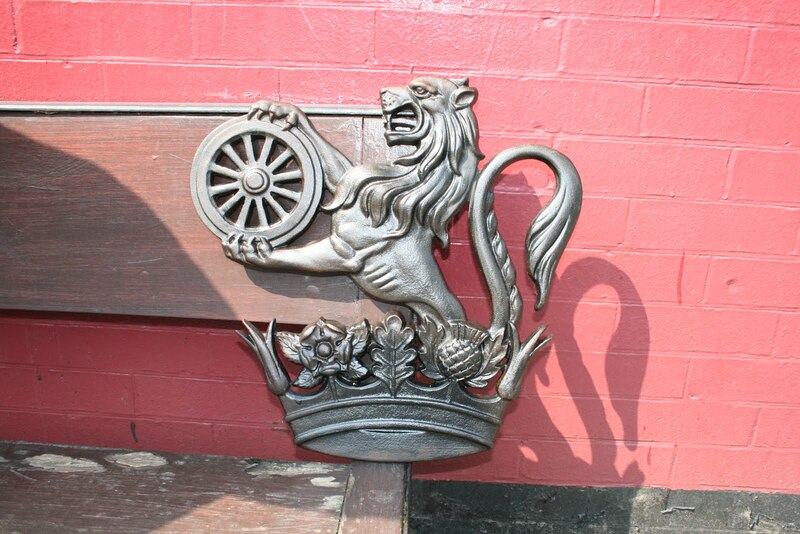 I am resisting a photo of the lining out, which is wonderful, but do attach a mystery picture of a recent donation to EVRA of the Lion and Wheel. 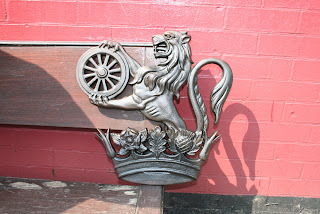 This is a heavy cast piece that may have had a place in Derby. Can anyone identify its provenance. Firstly, for those of you who missed my excellent publication last night the contents can be viewed on the web site ( www.e-v-r.com ) owing to our own personal satellite malfunctioning. I trust today's offering will reach all the usual readers as these publications take hours to prepare. We were delighted to host two customers today, one planned and the other remedying faults found yesterday. It was good to welcome two Network Rail participants who we had got to know well during their time with Delta Rail and catch up on their present projects. An extremely pleasant surprise was to receive a cheque for £1000 from Hingley's timber merchants at Hazelwood as a thank you for all the endeavours of the VCT to fence their station. The accompanying letter was extremely complimentary and the team can glow in the well deserved credit given to them. They all deserve our gratitude for a good job done and the wonders achieved for neighbour relations. The PWT divided into three groups to deal with the required whole line track inspection resulting in some very warm and sweaty people. Yet another PWT group arranged to recover the S&T van from Duffield and the RUDD from Shottle. This enabled the Komatsu to load further reclaimed ballast from the former Gorsey Bank line resulting in the RUDD and three Dogfish being filled for use on problem areas on our "main line" where ballast is "light". The LCC targeted the Training Room and my office for attention as well as the service two car set. Again a sweat, or glow, was developed in the delightful weather produced for today. The Head of Gardening also glowed in the warm sunshine and suggested shoe was going to cool off at Alport Heights - the mind boggles. An unreported activity yesterday was further oiling up of our wagon fleet at Shottle and the appropriate records completed this afternoon. Doug, the oilier, announced he would be leaving us next week for Malta, his wife being aware there were no railways there. For those twitches our there I am advised that seen at Wirksworth were grey wagtails in the station area. The LMSCA were out in force to detach the northern corridor connection and faceplate from the Brake Third Open and support the equipment precariously, but safely, between their two vehicles. Shunting in this area is now prohibited while they tend to the problem area. Down at Duffield the DTT varnished door steps having been somewhat shocked to find a lawnmower parked in their beautifully created Gents toilet. I fear a call from the constabulary if the culprit is caught and looses essential parts of his anatomy. The Booking Hall and Pullman Buffet Car continued with their revenue raising activities. PS A note from Bob Gibbens reports that Messrs Gibbens and Swepstone recently visited a relatively new railway museum in Jawroszna Slaska, Poland, to look at the possibility of laying a short siding for them. All materials are on site but they do not have any bodies to do the work. The two Bobs are looking for willing volunteers to go out for 4 or 5 days around the first week in September to do the job for them. The reward is to have a locomotive in steam for the use of the volunteers which I suspect will be slightly larger than our own stable. Accommodation is around £30 a night B&B or the use of their fully kitted out sleeping car. Air fares are around £100 and beer and food is inexpensive. Anyone interested should contact either of the Bobs or I will forward expressions of interest. Having been to Poland a few times to pursue my passion for trams I can commend it as a splendid destination which provides a mix of present day comforts and a feel of life 30 or 40 years ago. PPS Neil has been extremely energetic in engaging the good traders of Wirksworth with the pleasant and productive efforts for the town by our activities. You can imagine my language on receiving the 2012 Carnival brochure that shows the location of Wirksworth station with the legend "trains run to Idridgehay and the line is being cleared to Duffield" - how do you get through to these people! Today's report will resemble a novel due to the number of activities achieved through the day. Joy was unbounded as a customer was hosted by Mick through the day as they tested a couple of machines. One developed a fault which may mean they have extra work for us tomorrow which, of course, we will accommodate in our busy schedule. The VCT experienced their first day back at Wirksworth as a base and travelled to Barnsley Lane to start the mammoth task of clearing up the "racing straight". Much progress was reported with two good fires in the vicinity of the bridge and some of the ivy was removed from the structure. The adjacent river bridge received Alan's attention to the steel guard rails that had become rusty and unattractive. Mick Kingsley was put to good work with his strimmer on the footpaths at Barnsley Lane, 40 steps and the grassy areas around the Station garage at Wirksworth. The LMSCA wrestled with the northern corner pillars of the Brake Third Open which had perished after temporary repairs many years ago. The PWT worked away at Shottle jacking and packing a further section of the loop together with unloading the Flatrol of its load of reusable sleepers recovered from Gorsey Bank. This will give us a small nucleus of material for spot resleepering of the "main line". Under Dorothy's watchful eye the tubs and planters at Wirksworth took on a new Jubilee look with red, white and blue featuring. In the middle of the day Dorothy had a tooth extracted, by appointment with the Dentist across the road, and returned to the task afterwards. Not many people are as dedicated as this - I certainly would have taken to my bed! Fred & Iris were also in go mode as they cleansed the Mess Hall and then went on to ensure the bedding plants were strategically placed. David N tended to the water heater in the Booking Hall and a leaking joint by the Brewery container. Geoff Adams found the right end of a paint brush and started the repaint of the Model Railway container and the Filing Fairy was welcomed back after a visit to Poland. The DST dealt with a weekly service of No3 and made significant progress with the vacuum pipe fittings for Henry Ellison. Further hydraulic testing of Henry Ellison's boiler revealed yet more work to be achieved with this long term project. 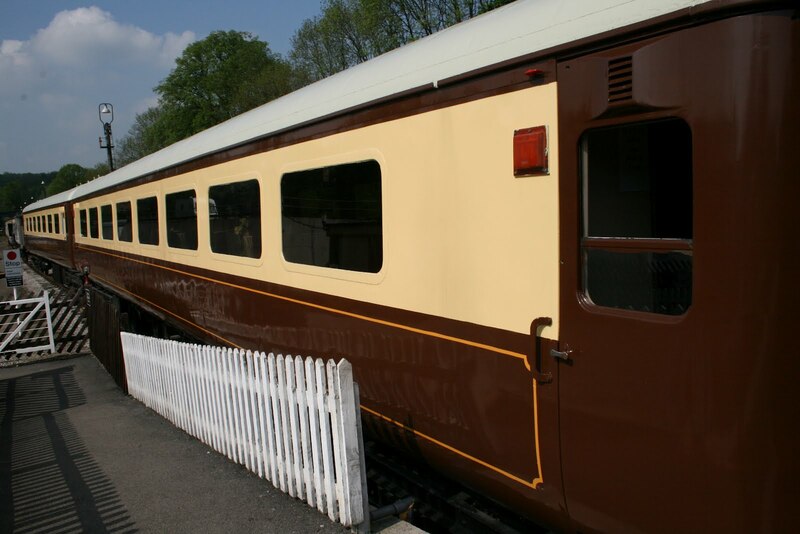 The Pullman Buffet Car and Booking Hal benefited from the steady increase in off season visitors including couple from the North Yorkshire Moors Railway which were given our traditional warm welcome. Monday 0900 to 1700 and Tuesday to Friday 0900 to 1330. If there is any interest out there contact Angela on pullman@e-v-r.com before we go back to the Job Centre. A nice sunny day for a change with the up side of the line from Idridgehay to Duffield treated with weed killer. 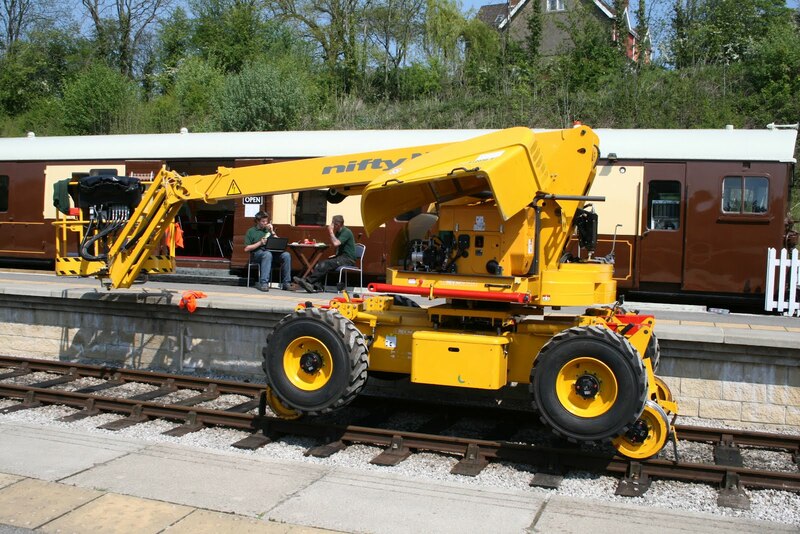 The ground frames at Duffield and Shottle have had their monthly oil and inspection with the komatsu and oxy cutting equipment returned to Wirksworth. Further attention to our steel barrier at Wirksworth means this facility is now operational again so can the last person off site make sure it closed and locked on departure. The station buffet has had a few customers today basking in the sunshine. It is with pleasure that I can announce that after receiving a further generous donation the rail bender fund now stands at £5040 which means we are now in a position to purchase - many thanks to everybody who contributed. Having heard the horrifying news of the death of a member of one of our fellow railways our sympathy (and I'm sure I speak for all of us here )goes out to the family and friends, and , to the other members of staff and volunteers who must be feeling devastated. We can only say we are are thinking of you. It is a terrible reminder of how dangerous an industry we work in at a time when most people now work in offices , shops and at home the railway industry along with the remnants of our other heavy industries can still take a toll on our lives in an instant - please be careful out there. There are reports of a death of a "railway worker" at Grosmont today on the North Yorkshire Moors Railway "trapped between two trains". Our deepest thoughts go out to his family and friends. respectable number of passengers to enjoy the valley's spring delights. creative moment by building a path towards it. for as you know, we don't do tatty at our railway. the railway. Well, we do like to keep them off the streets. What's happened to spring? A cold day down at Derbyshire's favourite branch line meant modest passenger numbers. At Wirksworth we welcomed a group of new volunteers who were introduced to the railway and successfully undertook their Personal Track Safety and Fire Safety training. The model railway enthusiasts wired some point motors and have expressed a warm invitation for anyone who might like to help them with their endeavours. Down the yard the 8F group huffed and puffed as they continued their boiler restoration. The class 31 received some attention and the DMU team continued their rapid progress with the class 119 interior and work continued on the Bubble Car's exterior. It was good to welcome members of the RAIB for a training day enabling them to research two scenarios and have further familiarisation with the wealth of equipment they take to incidents. 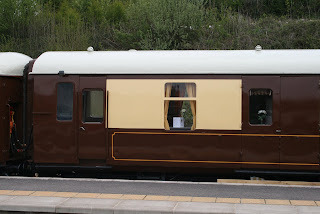 There were a surprising number of visitors including a couple from the Weardale Railway giving a boost to the Pullman Buffet Car takings. The RAIB team also eat in the Buffet with the breakfast drawing enthusiastic comments, in fact the facility was so popular that several visits were made. Further preparation for the main gate renovation continued as did fettling of the narrow gauge, its stations and rolling stock. Jon Allsop began to work his magic again on the Pullman Cars and an image of the start of the lining out is attached. Absolutely delightful! The Booking Hall processed group bookings, despatched marketing literature and generally prepared for the upcoming weekend. The PWT concentrated their efforts on the ballast deposited yesterday on the Shottle loop line, jacking and packing some 80 yards of the installation. EVRA dealt with the bases for the new Wash Green water tank, receiving ready mix concrete into shuttering made by John Gratton. All was over in 10 minutes because, as they say, preparation is all. The dmu team washed more of their fleet and 51505 finally had its roof leak resolved. It was good to see Dan and Mike Evans working together on the Bubble Car to sand it down ready for painting. The VCT moved northwards during the day and dealt with weather damage in the area of footpath F10, also know as Willow Crossing, between Shottle and Idridgehay. 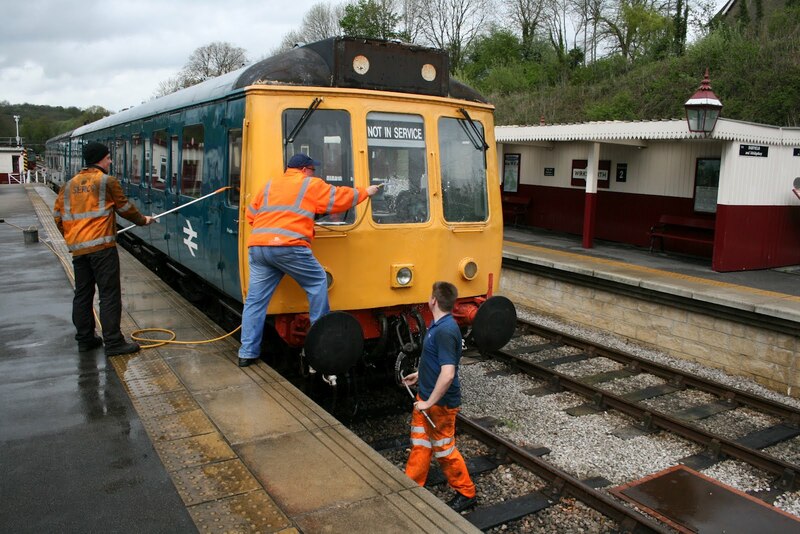 They are preparing to operate from Wirksworth during the summer running period. Rod and Mary continued their efforts to sparkle up the narrow gauge for the new season accepting the maxim that "presentation is all". The Buffet Car again improved its performance from visitors to our site and the Booking Hall further progressed our on line bookings. Quite a pleasant and fairly warm day. 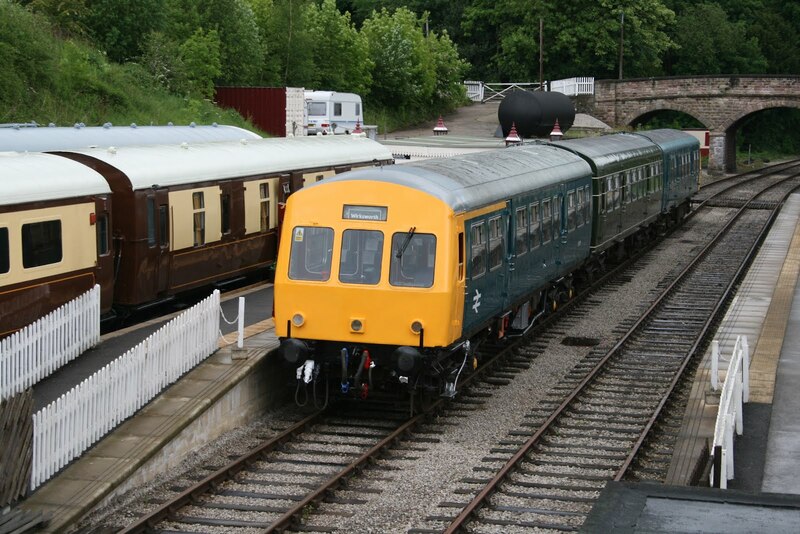 Tickets are now available to purchase online for the two planned Fish and Chip Special Excursion trains on Saturday 11th August and Saturday 27th October 2012. The excursion on the evening of Saturday 11th August will be Diesel locomotive hauled as part of the Diesel Locomotive Event Weekend taking place on that day. Tickets are priced at £5 as a top-up for Day Rover holders so you can purchase your Day Rover and Excursion ticket in advance from the online shop or just purchase the Excursion ticket and purchase a Day Rover at your leisure. A ticket for the Excursion includes a return trip between Wirksworth and Duffield and a portion of 'the nation's favourite food' served to the train on arrival at Duffield. It is expected to be busy so pre-booking is essential - bookings are being taken up to 16:00 on the day of the excursion if capacity allows. Please visit the Online Ticket Office to purchase your tickets. We haven't had a first for a little while but today remedied this with the first ever steam hauled ballast train in our history. We needed a locomotive with a light footprint to commence the ballasting of the Shottle loop and No 3 was the chosen candidate. The down side of steam is that it requires a very early start to raise steam and a long day before disposal can be completed. Nonetheless the steam team rose to the challenge and the exercise went faultlessly ending up with the initial ballast being dropped without incident and the empty Dogfish returned to Wirksworth this evening. Many thanks to all concerned. Tony W and Richard P took the opportunity today with is dry weather to weed treat the Wirksworth Yard and environs. Their dedication to this essential work is beginning to show good results along the line as we try and bottom the task in 2012 to have a weed free Railway. The LCC gave the Training Room a clean together with the service two car set and Rod and Mary spent the day repainting the manrider and Lister to enhance the presentation of the narrow gauge. The Buffet Car had an encouraging day with the assistance of a native of Norfolk who brought friends to swell the coffers.The Booking Hall responded succinctly to enquiry from the Kent & East Sussex Railway about our web cams containing detail that would phase all but the most qualified in computer science. This again demonstrates the wealth of talent we have amongst us and high level of professionalism. On line bookings for future events also featured moving our enterprise up yet another gear. The day was rounded off by the steam hauled engineering train returning to Wirksworth giving onlookers a delightful sight. It always amazes me how far we have come in a relatively short time. There will be more photos of today's steam excursion but I hope you find the attached atmospheric. It shows of all the efforts of the VCT to open up lineside views and the PWT who have fettled the track together with the hard work of the restorers of the locomotive emphasizing that the Railway is a collective of a multitude of skills and endeavour. Just basking in the kind comments about our daily reports printed in Heritage Railway. After eleven years of these ramblings it's quite nice to think they are appreciated beyond our own bubble. However, onwards and upwards, as the PWT were in go mode, after a little local difficulty with traction at Gorsey Bank, and recovered three Dogfish and one Rudd load of reclaimed ballast for recycling to the Shottle loop project. They also recovered the last of the recovered sleepers from this section and prepared the works train for tomorrow. The British Waterways Board collected 40 garden quality sleepers for a footpath project in Warwickshire. Another part of the PWT completed the initial jacking and packing of the loop and Doug, the apprentice C&W examiner, took time out to service the Lowmac located there and the Mermaid. These engineering vehicles have oil bath axle boxes that need tending to from time to time and the brake rigging requires oiling and the handbrake mechanism checking. The VCT have now completed the fencing at Hazelwood station it now awaits the final embellishment that will be attended to be Alan on Thursday. A photo will follow. The DST gave No3 a boiler wash out with much sludge being released and continued their quest with Henry Ellison's wash out plugs. This has been quite a frustrating part of the project and there is still more work before the boiler can be given an hydraulic test. Fred and Iris returned to the Mess Hall cleaning and I am pleased to report they were not faced with quite so much washing up to do. Yesterday there was an whole line weed treatment run with many thanks to Tony W and Richard P for undertaking this necessary task. There was a further attempt to resolve the security gate at the head of the station approach at Wirksworth culminating with its rehanging today. The DTT reported that their task is fully complete with the damaged roof tiles replaced and the reported effect is that you would never know the building was ever damaged. The Buffet Car and Booking Hall had productive days with a growing attendance at the Buffet and a tidy up of the weekend's accountancy in the Booking Hall. There may be something tomorrow that will delight those who like a steam experience. It will not be known until the locomotive has a fire in it tomorrow morning following the boiler wash out. If all is well No 3 will work our first ever steam hauled ballast train to Shottle needed because of its low axle load to reach the presently unballasted Shottle loop line. The Pullman Buffet Car offers quite a welcome whilst this event unfurls. as "Buffeteers", perhaps these are like Musketeers but with pork pies. fruitless attempt was made to fix the leaking platform 2 tap. continuous stream of customers right up to closing. ably assisted by 'one man and his dog' worked on the E.T.H. of 33035.
completed his Guard training today. The main activity today was a pleasant Steam Experience Day with two participants with us for the full day and one who had a taster session this morning. My thanks go to Mick and Neil who manned the engine and John Evans who acted as guard for the day. In the warm sunshine the mower was brought into action for the picnic area and the approach road bank. Another example of all the background effort that goes into making our Railway tidy and welcoming. The Pullman Buffet Car team looked after our experience customers together with the train crew and the Booking Hall fielded the usual selection of phone calls. Omitted from yesterday's report was the energy put into the Shottle loop with screwing down, jacking and packing featuring. The whole line track patrol was completed with Ravenstor and the section between Idridgehay and Shottle polished off. We welcomed a customer for testing and observance by the Vehicle Acceptance Body providing three concrete sleepers as a test load for the small trailer to be towed by the vehicle. All the work was achieved within Wirksworth Yard and the parties seemed pleased with their endeavours. The dmu team continued with work in the Maintenance Facility to seal 51505's roof and checked over the two car service set. The team then indulged in a little water play before arranging for the Class 20 to release the LMS Brakevan required for tomorrow's activities. The VCT continued their project to smarten up the boundary at Hazelwood station which will be a noticeable improvement to the vista for our passengers. The Booking Hall received further group booking deposits and enquiries and the Buffet Car entertained a respectable number of customers. Exterior carriage cleaning is demonstrated in the attached photo. The quality of presentation of our vehicles exteriors and interiors marks us out from any rivals. This is not an accident but occurs due the diligence of a number of people and they should be roundly thanked. As hinted at in the daily progress report, by popular demand we are pleased to announce our first ever Skiffle and Chips evening on Saturday 8th September. Take an excursion between Wirksworth and Duffield with live skiffle music onboard from local band Please Y'Self. Some of you may remember they shot a video for one their songs on the railway at the back end of last year. Full details at http://www.e-v-r.com/skiffle including how to book online (we aren't doing telephone bookings for this event). The day started so well in warm sunshine giving a spring in the step and then went gently downhill to persistent rain this afternoon. However, the track patrols accomplished their tasks between Idridgehay and Wirksworth with a second team tackling the Duffield to Shottle section. The PWT gathered at Shottle to achieve further work on the southern pointwork of the loop project. At Wirksworth the LCC cleansed the two car set that operated over the Bank Holiday weekend and also completed the refurbishment of the Ladies toilet. She was seen at lunchtime with a very large sandwich, claiming that there was no filling other than butter, but one suspects it was extremely nourishing. Another lone participant was the Head of Gardening quietly attacking the Station garden with no mention of unwelcome deposits today - I may stand corrected on her next visit. Magnificent news from Duffield as the toilet project was fully completed at 1300 hrs today. This really does reflect immense credit on all concerned who have converted a former mobile telephone mast building into an essential service for our growing number of passengers who will never appreciate the effort put into their comfort stop. They are not content with this milestone but have volunteered to repair the roof of the building where the tiling has been damaged by previous tree felling by the developer. It is now difficult to picture this area before the flats but is was a wild area of scrubland with quite mature trees and evidence of indiscriminate tipping. The Buffet Car saw an encouraging growth in weekday visitors and the Booking Hall had a web site day with many new products now put on line including our first ever skiffle train. My father told me about Bert Weedon and his Band - must be something of a revival in this form of torture. I am also moved to report on one of our very unsung heroes, Ernie Marchant, who processes all your share applications, produces the Share Certificates, requests EIS returns from the Inland Revenue and reports to Companies House as is mandated. One of our most reliable "servants" that we rely on and couldn't manage without, achieving a significant amount of work efficiently without complaint. PS A new but essential group had their first meeting today. Styled as the Safety Management Review Group they are commencing the detailed process of revising all our safety related documentation in the light of the first year of passenger trains operating over our whole line. They have quite a hill to climb and those of you who attend the Railway will not fail to notice their activities over the next few months. Be not afraid, the team are there to help develop a better and safer organisation for ourselves and our customers. The locomotive rosters and timetables are now available online for the Diesel Locomotive Weekend on 23rd/24th June 2012. Our heroes of the day are Fred & Iris who dealt with an inordinate number of unwashed mugs and plates from yesterday's activities and then gave the Mess Hall a very good clean. I do find it quite foreign that members can't manage to wash their pots after use and leave it to willing, quite vintage, horses to clean up after them, very disappointing! 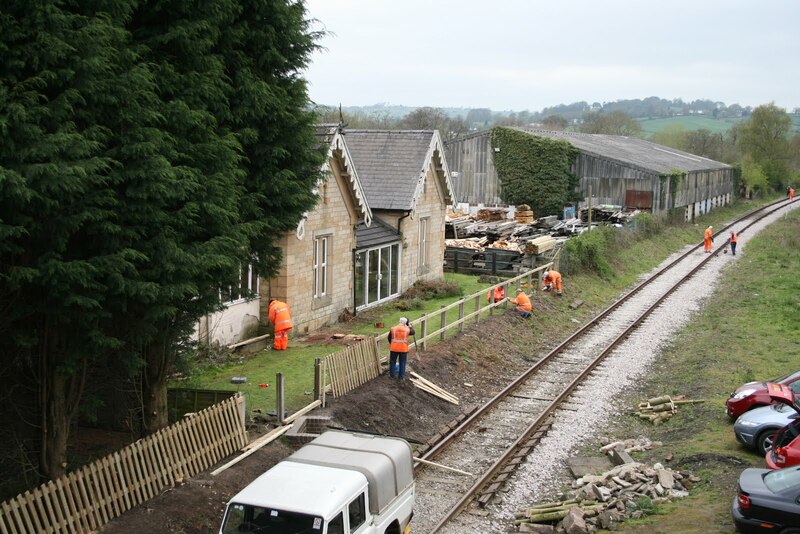 The VCT continued their efforts at Hazelwood and have now cleared the area from the end of the former platform to the start of the former riding stable for the installation of new fencing. The team also recovered a catch pit where the timbers had been displaced by unwanted visitors and had one fire to burn the results of their clearance activities. The PWT returned to the Shottle loop project and installed a further panel that spanned the footpath crossing north of the station. This also involved a timber decking for the footpath and adjustment of the topography in the area. The LMSCA continued their trouble shooting on the BTO and found that one of the corner pillars was quite rotten. Remedies are being devised for this setback. The DTT reported that all three cubicles now have tiled floors and one door needed a further coat of paint rendering the project complete all bar a few tidying up jobs. It is a tribute to the team involved that we now have very adequate facilities at Duffield in place of the temporary, and unpleasant, facilities we had to live with last year. 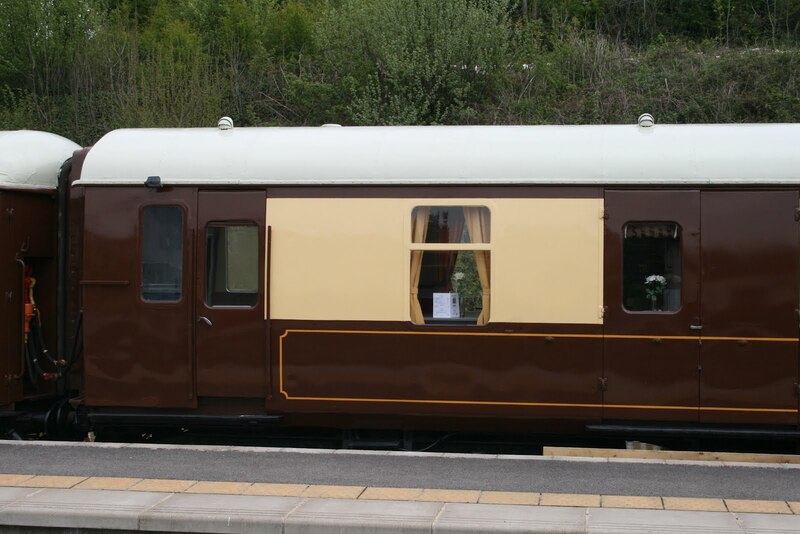 The Pullman Buffet Car and Booking Hall received a few post holiday visitors and the behind the scenes accountancy dealt with the results of the Bank Holiday Weekend. Comparatives with the year before yield an interesting picture. Remember that we had the splendid steam locomotive in 2011 with all the magic that it brought to the Railway, and the associated costs!, and consider that the fare income this Bank Holiday exceeded last year's take with somewhat lower costs. Interesting! continued their excellent progress on the class 119 (photo attached). with things being haphazardly lost or siphoned off around the railway. The first day of the Bank Holiday weekend was chill but mainly dry and was a surprising good start to the three days. Trade was steady and pleasantly boosted by an expected coach load from the Liverpool University Public Transport Group who had also visited Steeple Grange and Middleton Top. The day was also enlivened by a young group of amateur film makers producing a video to be shown in schools on the results of bullying. They were most ably looked after by John Evans with most of the day spent at the Hannages foot crossing. Tom Tait, in his role as Duffield driver, also played a significant part in the production requiring future requests to be forwarded to his agent. Lots of blood and gore featured in the denouement of the plot. Thanks are due to everyone who manned the Booking Halls and operated the trains today. Special thanks are also due to the catering team who are really coming on song. It is significant that 30% of today's income came from catering and bodes very well for the season ahead. There was much activity of an engineering nature with Graham assisting the Class 33 team to resolve a problem with the Drivers Safety Device, a start made with the interior panelling on the Class 119 and progress with the "duckets" on the LMS brakevan. The LMSCA planned the installation of steam heating on the BTO and concentrated on leaks that have manifested themselves in the recent downpours. Lorna reported excellent sales in the EVRA shop with one customer spending over £170. Pat and Mike Craft should be congratulated for their fund raising night yesterday at The Malt Shovel. The Horse Race Night raised over £400 for the Steam Engine Fund and I very pleased to report that the Millers investment was well rewarded by a win on the last race resulting in a net gain. We received four participants for a Group Drive a Diesel Day who were most ably hosted by Lewis and Richard. After some familiarity with D8001 the group were set the task of returning the LMSCA vehicles to their normal resting place which will enable the Association to continue their good work with the Brake Third Open. After lunch the shunt was completed and the team enjoyed a whole line tour which also acted as a survey of the Railway prior to tomorrow's service trains. The Head of Gardening reported that there was a surplus of dandelions which would provide a hearty meal for any of you who keep rabbits.The Wirksworth station garden continues to delight our visitors and Lynette is to be thanked for all her efforts. The Pullman Buffet Car did a little business today and the Booking Hall responded to a never ending ringing of the telephone. Also received, and placed on sale, were some very fetching mobile phone covers that feature, individually, all our operational locomotives. This surely is a must have for all the teams involved! A fairly gentle day with a lot of activity concentrated in the Hazelwood area. The VCT working in harmony with our neighbours at Hingleys the VCT are making a significant impact on the presentation of the former Hazelwood station. The PWT were also working in this area to capitalise on the ballast, of exceptional quality, dropped in the area yesterday.The picture attached was commended for its location by Alan Taylor to closely resemble a similar shot taken some 50? years ago of the station site and including in the Sprenger publication. Back at base there was much dmu activity as they prepared for the upcoming weekend. The Booking Hall and Buffet Car plied their trade with the Booking Hall taking a most pleasant large cheque for an approaching group visit and lunch. What a difference a day makes! Positively balmy today with no wind or rain to damage productivity.The stars of today were the PWT who achieved a legion of tasks with the help of D8001. The highest quality ballast, inherited from the Railvac project, was dropped in the Hazelwood station area where the application of this precious material was at its most sparse. Bob Swepstone will be proud that his pleas for "more stone" have been heard! The team also made great strides at the south end of the embryonic Shottle loop and loaded one wagon with logs and one with garden quality sleepers. 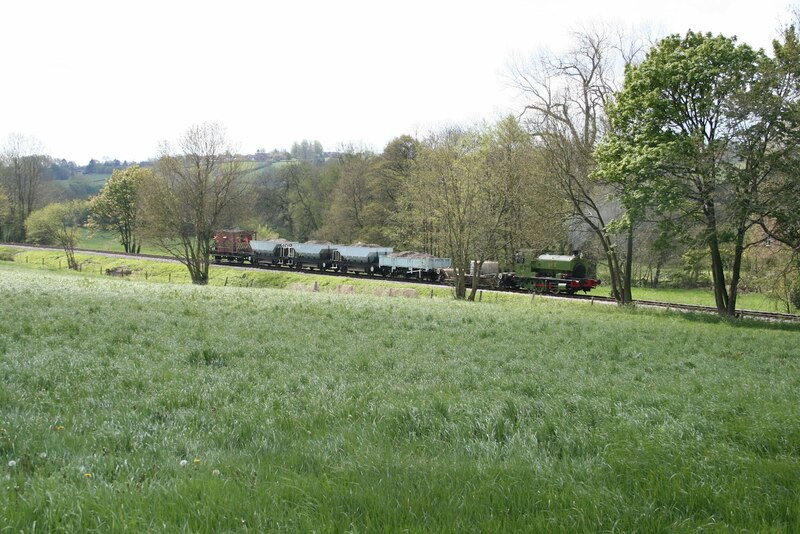 The returning freight train to Wirksworth was one our longest and really looked the part. A splendid effort by the team who had a long and exhausting day. The LCC cleansed the two car set used last weekend and painted the floor of the "Ladies" to great effect. Anton pursued his unsung task of putting up the temporary road signs for the Bank Holiday weekend and the Booking Hall and Buffet Car served a growing number of customers. The first day of the fifth month of the year proved to be as dismal as the last four weeks with wind and rain to make life unpleasant for all the team. As ever the show went on with the VCT renewing the fencing at the site of Hazelwood station with advice and guidance from Hingleys, the present occupier. They also burnt a quantity of material at footpath F4, south of Hazelwood, where miscreants had been placing a number of items on the line. The DST made progress with Henry Ellison and Kathryn but were slightly frustrated by problems with Henry's boiler. The collective brain was applied to the problem and I am sure the solution will emerge. The PWT report a long an wet day as they connected the south end of the loop and the LMSCA laid the final panel of the BTO's floor. The Buffet Car had a slightly more successful day and the Booking Hall dealt with the accountancy associated with the previous weekend. The Filing Fairy was in full flood leaving a number of tasks to be achieved during her upcoming two week absence.